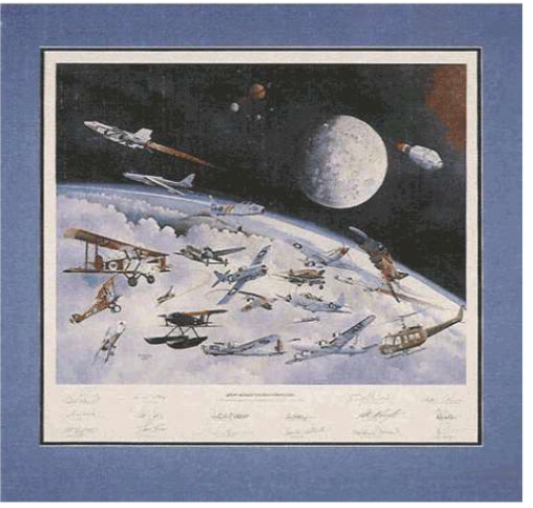 Thanks to a generous donation by Ohio State graduate and former Ohio State Airport employee Edward Pernotto, the following collection of artwork will be on permanent display on the second floor of the Austin E Knowlton Executive Terminal and Aviation Education Center beginning in February 2019. George Vaughn, fighter ace in World War I and Distinguished Service Cross, Britain's Distinguished Flying Cross, and Silver Star recipient. Leigh Wade, one of eight Army aviators who took off from Seattle to fly around the globe in four 2-winged, single-engine Douglas aircraft in 1924, which took 175 days. Jimmy Doolittle (WPAFB and CNAR), helped develop instrument flight, lead the famous Doolittle Raid on Japan in World War II. Curtis LeMay (The Ohio State University graduate), designed and implemented an effective, but controversial, systematic strategic bombing campaign in the Pacific theater of World War II. 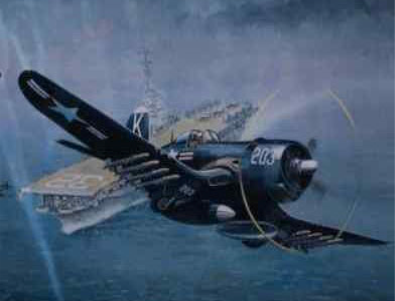 George Gay, of the 30 VT-8 aircrew from Hornet that participated in the pivotal Battle of Midway, Ensign Gay was the sole survivor. Joe Foss, leading Marine fighter ace in World War II. John Mitchell, leader of Operation Vengeance, the mission to shoot down Japanese Admiral Isoroku Yamamoto during World War II. 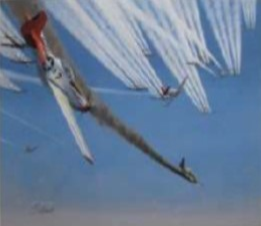 Chuck Yeager (WPAFB), the first pilot confirmed to have exceeded the speed of sound in level flight. Gail Halvorsen (WPAFB), an Air Force pilot who gained fame after World War II for dropping candy to German children during the Berlin airlift from 1948 to 1949. Paul Tibbets (EJA president), Air Force pilot who dropped the first atomic bomb used in warfare on Hiroshima, Japan during World War II. Gabby Gabreski, the Air Force fighter ace over Europe in World War II and a jet fighter ace with the Air Force in the Korean War. Robin Olds (Cleveland NAR), fighter pilot during World War II and Vietnam who was considered one of the best wing commanders of the Vietnam War. Michael Novosel, served in World War II, the Korean War and Vietnam. Awarded the Medal of Honor for bravery in Vietnam. Pete Knight (WPAFB),retired colonel, Air Force test pilot, set airplane speed record in X-15 of 4,520 miles an hour or Mach 6.70, a record that still stands. Neil Armstrong, first person to walk on the moon (born in Wapakoneta, Ohio), Navy fighter pilot during Korean War, test pilot including piloting the X-15 seven times, Gemini 8, Apollo 11, professor of aerospace engineering, University of Cincinnati. 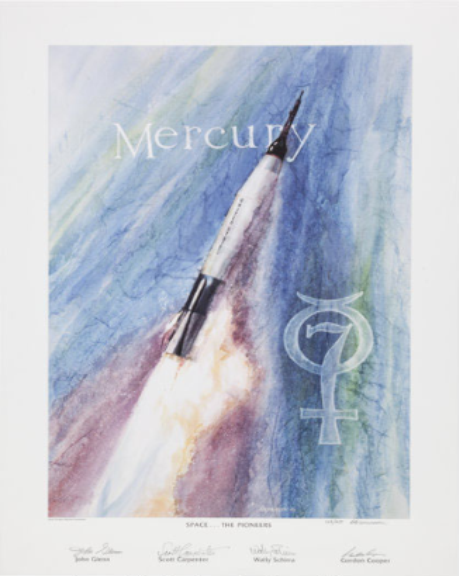 “Naval Aviators in Space” Naval aviator and artist Rasmussen painted a watercolor depicting scenes from America’s four greatest manned spaceflight programs: Mercury, Gemini, Apollo and the Shuttle. 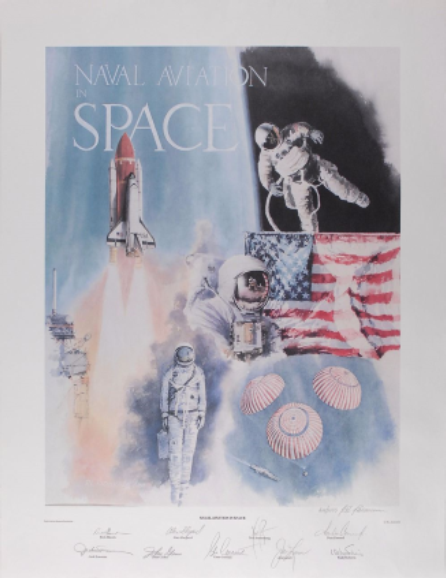 This is a limited edition print signed at the Naval Aviation Museum by nine Naval astronauts. Charles "Pete" Conrad, Jr., captain, USN (Ret), Gemini 5, Gemini 11, Apollo 12, Skylab 2, third human to walk on the moon. Jack Lousma, colonel USMC,(Ret. ), Skylab 3, STS-3. Frederick "Rick" Hauck, Captain USN (Ret,) STS-7, STS-51A, STS-26. 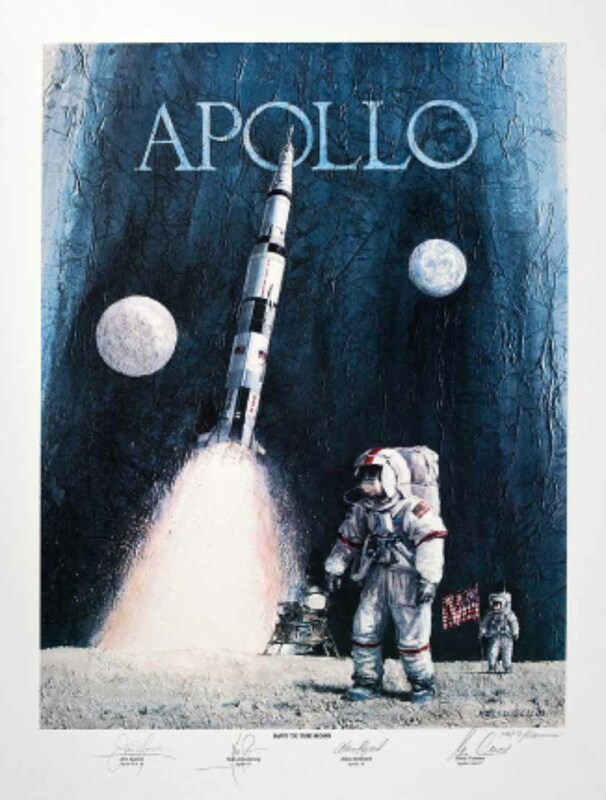 Scenes depict the Apollo missions to the moon and signed by James Lovell, Neil Armstrong, Alan Shepard, and Gene Cernan. 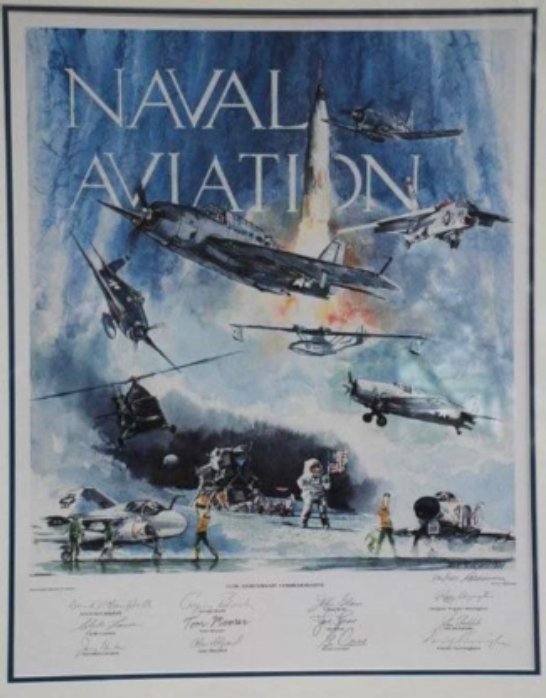 The print was produced to raise funds for the Museum of Naval Aviation in Pensacola, Florida. 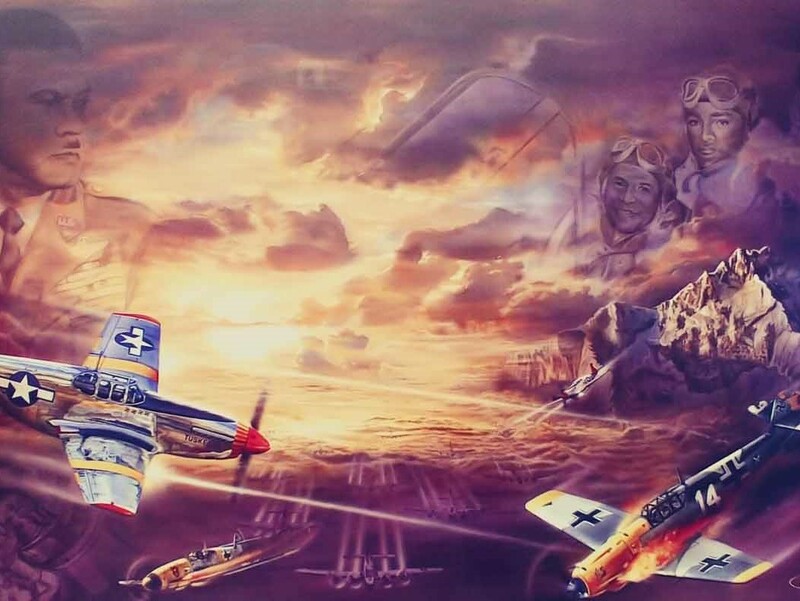 Ric Druet created a series of four prints for the 50th anniversary of the 332nd Fighter Group. 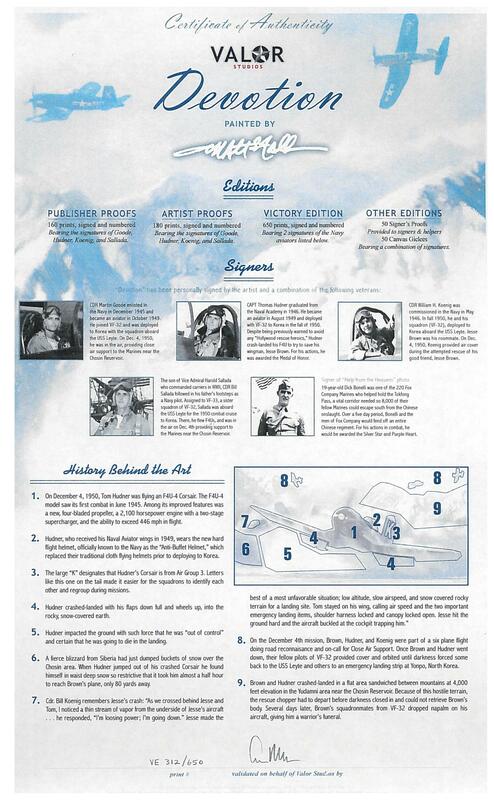 There is one print for each squadron. There are 26 Tuskegee Airmen signatures on the set, including the rare signature of Benjamin O. Davis Jr. 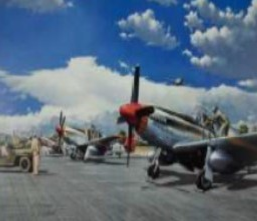 Artist Ray Simon has paid tribute to the men and women of Tuskegee. 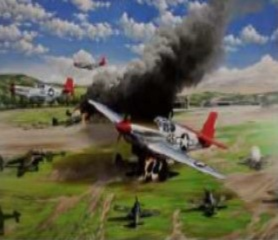 Depicted in this painting is a World War II battle in Germany.